Represents the value of each bin as the number of samples in that bin. Represents the value of each bin as a percentage of the total. Number of bins in the histogram. Maximum value to include in the histogram. Minimum value to include in the histogram. The boundary of each bin to handle. If inclusion is set to lower, the bin widths are determined according to the following equations. If inclusion is set to upper, the bin widths are determined according to the following equations. The histogram of the input signal. This input accepts a cluster or a 1D array of clusters. An array of the center values of the bins of the histogram. Discrete histogram of the input signal. 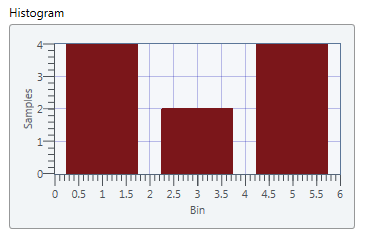 Actual number of bins in the histogram. This output can return a 32-bit signed integer number or a 1D array of 32-bit signed integer numbers. Actual maximum value in the histogram. Actual minimum value to include in the histogram. Information about points that do not fall in any bin upon successful execution of the node. Total number of values in signal that do not fall in any bin upon successful execution. Number of values in signal below the first bin on the lower boundary. 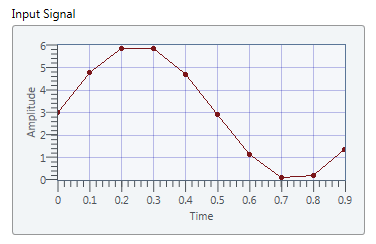 Number of values in signal above the last bin on the upper boundary. The histogram is a frequency count of the number of times that a specified frequency bin occurs in the input sequence. The node constructs histogram as follows. The following equation calculates the width of the frequency bin Δx. where max is the maximum, min is the minimum, and m is the number of bins. The node calculates the center of each frequency bin according to the following equation. The node defines the range of the ith frequency bin according to the following definition. The node scans the input sequence, calculates the number of samples in each frequency bin from 0 to m - 1, and returns the histogram. The following illustration shows the waveform of an input signal. For the previous input values, the following illustration shows the output histogram for the input signal.